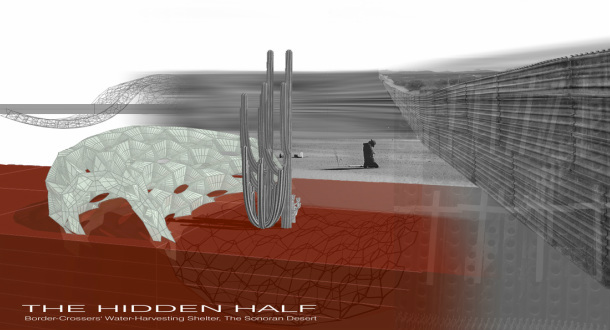 “Water Harvester” is a woven network of artificial roots that mimics the water location and retention ability of native desert plants. Capillarity and micro-encapsulated phase change materials are used to generate a humid bio-climatic “island’” to sustain desert crossers in border zones. The harvesters are intended to be deployed by local humanitarian groups as a life support device. The assembly is constructed of pores from acrylic, silicone and latex with a shape memory alloy driven capillary pump.